Trade Yer Coffin for a Gun by Mer Whinery is one truly weird Western. It reads like a mash up of From Dusk Till Dawn, High Plains Drifter, and Zombie–this is a big, bold, B movie of a book that revels in its inspirations. Let’s face it: any tale that brings in references to Mario Bava and Lucio Fulci right from the start is going for a certain tone. And it achieves it. The story follows Jubilee “Sugar” Bava, her twin brother Cutter, and their elder brother Micah–mercenary gunslingers collectively known as The Haints. Orphaned and driven out of their home town of Coffin Mills by corrupt officials, the trio are lured back to battle a supernatural threat to the town’s children. Of course, the opportunity for bloody revenge has something to do with it, too. Did I mention that Sugar Bava is also the Witch of Fulci Holler? And that there are not one, but two monstrous horrors to defeat? And that another witch shows up to help? Over the top is an understatement. Trade Yer Coffin for a Gun has vampires, witches, ghouls, zombies, prostitutes, gunslingers, necrophilia, black magic, white magic, Satanism, and a little Lovecraft thrown in for good measure. There is so much packed into Trade Yer Coffin for a Gun that a lot of potentially interesting details get pushed to the side from sheer lack of space. Micah’s tragic marriage, one monster’s connection to another, Sugar’s need to drink blood–all are dropped into the story without context. They left me wondering, and wishing for an explanation. However, the sloppy editing throughout the book interferes with the raucous action and undermines the atmosphere-building. For example, the first chapter heading promises a cold October night, but twice in the following pages we are told it is spring. Sugar Bava rides a pure white mare that several pages later has a chestnut mane. And littered throughout are overlooked typos that make the characters’ dialect harder to read than it should be. 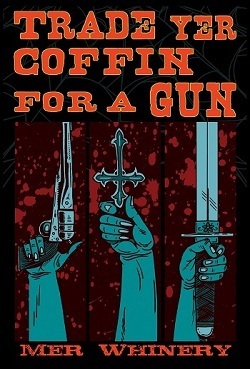 After all is said and done, Trade Yer Coffin For A Gun is an entertaining page-turner for those with a taste for horror and gleefully excessive gore. I don’t know how well it would stand up to a second reading, but the first time through was good, old-fashioned, gross-out fun.